ca 380 - 360 B.C. Detail of the goddess Iris from a painting depicting Telephus threatening the infant Orestes in the presence of his father Agamemnon. 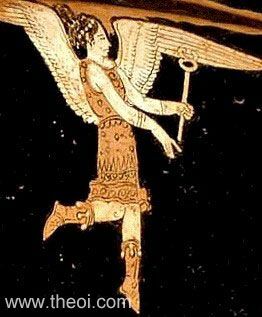 The winged goddess wears a short skirt and boots, and holds a herald's wand (kerykeion) in her hand.